Preparation time: 15 minutes. Baking time: 25–30 minutes. Preheat oven to 350°F. Coat an 8″ x 8″ pan with cooking spray. Layer broccoli in bottom of pan. Top evenly with rice and then chicken. In a large bowl, whisk together soup, mayonnaise, milk, curry powder, dill, and lemon juice; mix well. Pour evenly over chicken. 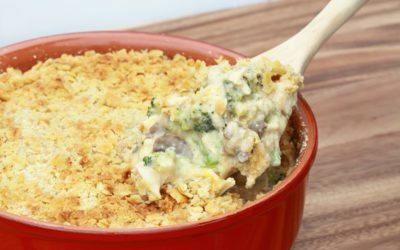 Sprinkle top of casserole with bread crumbs and paprika. Spray cooking spray over bread crumbs (to help them crisp during baking). Bake uncovered for 25–30 minutes, or until bubbly. Exchanges per serving: 1 starch, 1 vegetable, 2 1/2 lean meat. Carbohydrate choices: 1 1/2.